Nutritionist Maya Feller shares tips to healthy choice the week of Thanksgiving. camera (STOCK PHOTO/Getty Images) A Thanksgiving meal is pictured in this undated stock photo. Stuffing, sweet potato casserole and pumpkin pie, oh my! On Thanksgiving, the average American consumes 4,500 calories, according to the Calorie Control Council. That's why "Good Morning America" tapped nutritionist Maya Feller for her tips on how to do a Thanksgiving "pre-tox," a healthy eating "detox" leading up to the traditional Thanksgiving meal, so you don't feel badly enjoying your family's favorite side dish and dessert. Making healthy eating choices all week long, getting in some extra exercise and eating mindfully at the big meal itself are some of the ways that you can help offset weight gain, according to Feller. Read on for the tips she often gives to clients as Thanksgiving approaches. Don't skip meals. Be sure to have a balanced breakfast, lunch, and dinner. When you skip a meal you are more likely to overeat at your next meal, simply because you are hungry. Having regular meals also minimizes blood sugar highs and lows and the cravings that comes with them. - Be mindful of portion size. - Increase the non-starchy vegetables (leafy greens). - Decrease the refined grains and swap for a limited portion of starchy vegetables or whole grains. Stay well hydrated. We all need water, it helps our bodies function optimally. Sometimes when we are dehydrated we think we are hungry, when in fact we are thirsty, so don't forget especially going into the holidays to give your body the water that it wants and needs. For most, that’s at least 1 liter of water per day. Try my favorite hydrating homemade tea of hot water with lemon juice or lime juice and cayenne pepper. Pro tip: Try going easy on the alcohol in the days before Thanksgiving as well. Reduce or remove added sugars, fats, salts, preservatives. These can wreak havoc on some peoples' systems, causing gas, bloating, GI distress as well as cravings for more. Skip the packaged goods. Ready-made meals tend to be higher in sodium, saturated fats, added sugars and other preservatives. Aim for a minimum of 30 minutes of intentional physical activity on each day. Many people want to save up for the big meal, but it's important to remember that holiday meals are one meal of many. It's a time to enjoy good food and great company on a special occasion. Being mindful and making intentional choices helps to make the food experience all the more enjoyable. I recommend starting the day off with a balanced breakfast and even having a mid-morning snack or lunch depending on when the main meal happens. Start the day with a protein-rich breakfast. Egg cups are an easy and healthy breakfast idea. You'll need a six-cup muffin tin. Place one of each of the following ingredients in each muffin opening and bake at 350 degrees for 15 minutes or until firm. Serving size per person is two egg cups. 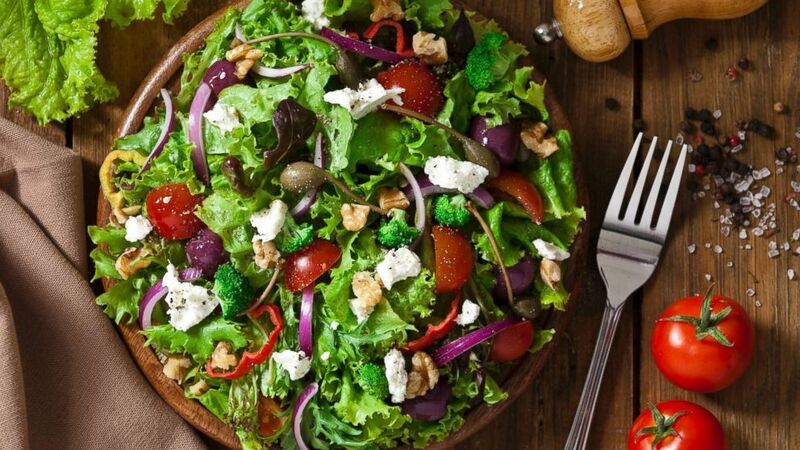 (STOCK PHOTO/Getty Images) A colorful salad is pictured in this undated stock photo. Or try Salmon salad roll-ups. Combine salmon with stone ground mustard, red bell peppers with dill and scallion. Place into the center of a leaf of Bibb lettuce and roll up and enjoy! Exercise. If you don't exercise, take a walk for 30 minutes. If you do, aim for 45 to 60 minutes of moderate to high intensity intentional physical activity. Resistance training builds muscle, which is more metabolically active than fat. (STOCK PHOTO/Getty Images) A woman is pictured jogging in this undated stock photo. - Make a realistic choice about what you will and will not have. - If your goal is to maintain your current body weight, have one plate with the majority of the plate as non-starchy vegetables. - If your goal is to lose weight you will need to adhere to your current diet plan and be very mindful of limiting your intake outside of your nutrition prescription. - Focus on the fun (if you can). The gathering is about the company, not just the food. 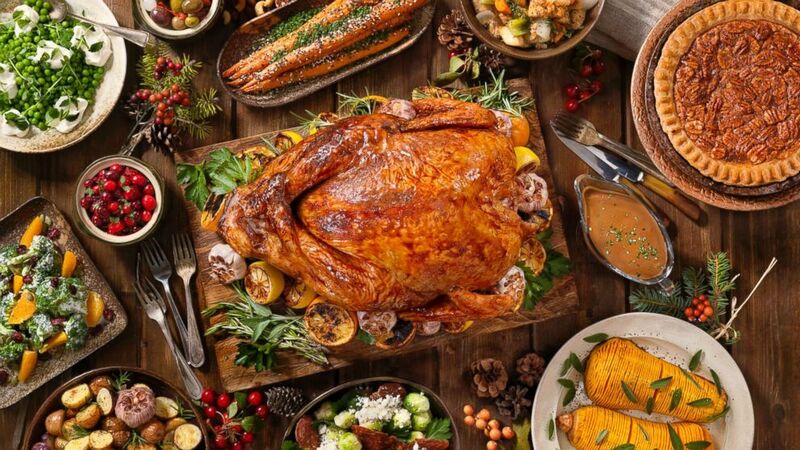 (STOCK PHOTO/Getty Images) A Thanksgiving meal is pictured in this undated stock photo. Use a small salad plate for hors-d'oeuvres. Limit yourself to one salad plate of hors-d'oeuvres. Go easy on the alcohol. Treat yourself to a drink, but it's important to be mindful that what you're drinking has calories too. Maya Feller, MS, RD, CDN, CLC is a Registered Dietitian who specializes in nutrition for chronic disease prevention. She shares her approachable, real food based solutions to millions of people through regular speaking engagements and as a nutrition expert on "Good Morning America."